FilterBank2, Software Filter from Tone2. No worries, we run the install and off you go ..... as most of the plugins. Well, the manual is provided only in English but it clearly explains the different editable parameters. I have clicks and pops when changing filters and small graphical glitches when I turn the knobs, and other than that ..... no update to correct this. 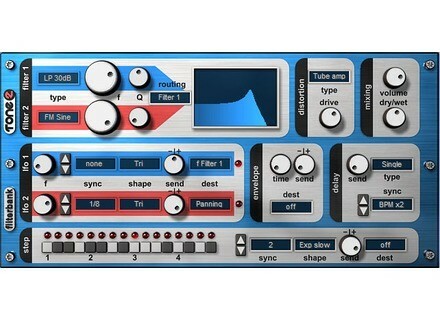 I bought it not long ago but I am already in love ...... me who wanted to buy a new synth, this plugin has something to change the sound of the synths I already use ... .
No, but there is Filterscape U-He who seems very powerful! Excellent because it has two plugs for the price of one ... unless we take into account the upgrade which costs a little less than the price of the plug. Well it's been almost a year since I have and there are some bugs that the developer did not correct ... the way for the modest sum of 40 euros, I can upgrade to version 3 which makes me a total of 80 euros .... it hurts to correct bugs !!!! !